J Leukoc Biol. 2013 Aug;94(2):291-300. doi: 10.1189/jlb.0812401. Epub 2013 May 21. IRAK4 kinase activity is not required for induction of endotoxin tolerance but contributes to TLR2-mediated tolerance. Xiong Y1, Pennini M, Vogel SN, Medvedev AE. "Reprogramming  of TLR4 signaling in endotoxin-tolerant monocytes and macrophages does not occur as a result of decreased TLR4 expression but involves altered recruitment, tyrosine phosphorylation, and K63-linked polyubiquitination of proximal receptor-adapter-kinase complexes [22,–27] and induction of negative regulators IRAK-M, SHIP1, and A20 [24, 25, 28]. Although a few studies have sought to dissociate kinase and adapter functions of IRAK4 in IL-1R/TLR signaling, albeit with conflicting results [13,–16, 29,–31], it is unclear how IRAK4 kinase activity affects induction of TLR2 and TLR4 homo- and heterotolerance. To address these questions, we used IRAK4KDKI mice to determine the impact of kinase deficiency of IRAK4 on the induction of TLR tolerance. Our data showed comparable induction of endotoxin tolerance in WT or IRAK4KDKI PMs and BMDMs, as judged by attenuated MAPK phosphorylation, inhibited expression of proinflammatory cytokines and chemokines, and up-regulation of negative TLR regulators, A20 and IRAK-M. Notably, IRAK4 kinase activity was found to be a prerequisite for conferring inhibition of LPS-inducible JNK and p38 MAPK activation following prior exposure to Pam3Cys. These results represent the first systematic analyses of the role of IRAK4 kinase activity in TLR homo- and heterotolerance and pave the way for improved understanding of how IRAK4 kinase dysregulation may underlie immunocompromised states in late sepsis." TLR2 signaling depletes IRAK1 and inhibits induction of type I IFN by TLR7/9. Pathogens may signal through multiple TLRs with synergistic or antagonistic effects on the induction of cytokines, including type I IFN (IFN-I). IFN-I is typically induced by TLR9, but not TLR2. Moreover, we previously reported that TLR2 signaling by Mycobacterium tuberculosis or other TLR2 agonists inhibited TLR9 induction of IFN-I and IFN-I-dependent MHC-I Ag cross processing. The current studies revealed that lipopeptide-induced TLR2 signaling inhibited induction of first-wave IFN-α and IFN-β mRNA by TLR9, whereas induction of second-wave IFN-I mRNA was not inhibited. TLR2 also inhibited induction of IFN-I by TLR7, another MyD88-dependent IFN-I-inducing receptor, but did not inhibit IFN-I induction by TLR3 or TLR4 (both Toll/IL-1R domain-containing adapter-inducing IFN-β dependent, MyD88 independent). The inhibitory effect of TLR2 was not dependent on new protein synthesis or intercellular signaling. IL-1R-associated kinase 1 (IRAK1) was depleted rapidly (within 10 min) by TLR2 agonist, but not until later (e.g., 2 h) by TLR9 agonist. Because IRAK1 is required for TLR7/9-induced IFN-I production, we propose that TLR2 signaling induces rapid depletion of IRAK1, which impairs IFN-I induction by TLR7/9. This novel mechanism, whereby TLR2 inhibits IFN-I induction by TLR7/9, may shape immune responses to microbes that express ligands for both TLR2 and TLR7/TLR9, or responses to bacteria/virus coinfection. Let’s just cut right to the quick and show (above) that OspA causes endotoxin tolerance (and cross tolerance to LPS or TLR4-agonists, as well as TLR7/9 agonists, or vial infections) or post-septic shock (host rendered incompetent to “secondary infections”) as you’ve just seen. And there are plenty of other examples in the literature that show Pam3Cys or OspA is a fungal toxin, TLR2/1 agonist. As usual, we recommend you use those links and “See Related,” or “Cited By” on PubMed. Lyme Cabal members Gary Wormser and Allen Steere - and even the "CDC officer" criminal Paul Mead - finally admit Late Lyme and LYMErix diseases are immunosuppression outcomes. 'Say the "TLR2/1 agonism" (immunosuppression) is probably the "more important" driver of the disease outcome. Nat Rev Dis Primers. 2016 Dec 15;2:16090. doi: 10.1038/nrdp.2016.90. Steere AC1,2, Strle F3, Wormser GP4, Hu LT5, Branda JA6, Hovius JW7, Li X8, Mead PS9. And that is what we are here to show you J OspA never could have been a vaccine because it was a fungal toxin that is handled by TLRs 2 and 1. It’s triacylated and therefore much more toxic than even lipopolysaccharide (LPS, a TLR4 agonist). Interleukin-10 anti-inflammatory response to Borrelia burgdorferi, the agent of Lyme disease: a possible role for suppressors of cytokine signaling 1 and 3. Dennis VA1, Jefferson A, Singh SR, Ganapamo F, Philipp MT. Arthritis Rheum. 2012 May;64(5):1311-5. doi: 10.1002/art.34386. The Toll of a TLR1 polymorphism in lyme disease: a tale of mice and men. Sellati TJ, Sahay B, Wormser GP. FEMS Immunol Med Microbiol. 2000 Jul;28(3):193-6. Modulation of lymphocyte proliferative responses by a canine Lyme disease vaccine of recombinant outer surface protein A (OspA). Chiao JW1, Villalon P, Schwartz I, Wormser GP. You know what they say about scholars and true academics: Sometimes they’re really no good at practical applications because their heads all wrapped up in theory. But these clowns are neither. We just thought we’d mention it because it’s a thing. So, why is this important? Because the falsified case definition, Dearborn, was designed around passing off a bogus vaccine such as to claim “Lyme disease” was only an HLA-linked hypersensitivity response, limited to an arthritis in a joint so they could sell OspA as a vaccine,… which would then be the cornerstone of their intended monopoly (“enterprise”) on testing and vaccines for VBDs. Everything the Cabal does revolves around maintaining the PRETENSE that Dearborn was real and not a crime scene, including issuing “guidelines” and other reports about Lyme based on the Dearborn definition. Falsifying the case definition at Dearborn happened to pass off the bogus OspA vaccines. The triacyl Osps are fungal toxins, and the Cabal knew there would problems with OspA vaccines causing the same “multi-system disease” (Persing and Schoen) that we know of as Late Chronic Neurologic Lyme (really, post-sepsis syndrome) by 1993 from the early Phase I and Phase II trials (Barbour and Fish). Yet here we find 3 times Gary Wormser published that OspA or the Osps, being triacyl lipoproteins, cause instead, immunosuppression. If the vaccine is a lie, surely the testing designed around it was. We know that anyway from what the contributors to the Dearborn conference said about its accuracy, which was an average of 15%, or that the Dearborn Two-Tiered Testing criteria missed 85% of the cases. In order to prosecute, you have to show the perpetrators knew all of this was a lie. OspA was never a vaccine, and the Dearborn case definition is not real. And as you have already seen, Allen Steere knew that people with neurologic, chronic Lyme don’t make antibodies against the Osps (published that in 1993, same year he falsified the testing), so that majority, the majority of people in the world who don’t have the genetic background for a pre-disposition to Rheumatoid Arthritis (don’t have the RA HLAs), wont test positive, especially not to OspA, their first vaccine choice. They were conforming a disease around an intended vaccines-and-test-kits enterprise, the ALDF.com, but most VBDs are bearer of fungal antigens and most humans can’t handle those. Fungal antigens are seen by most human immune systems as toxins. Being straight up evil, the Cabal decided to ram this “Dearborn and OspA” thing through anyway, by trashing their victims. It almost worked. But in the end it seriously backfired because now the USA has an integrity problem in addition to being behind the game with all these Great Imitator disease outcomes like cancer. This Occam’s Razor report contains many proofs that the Health and Human Services (HHS.gov) knows what Lyme and Chronic Fatigue Syndrome are. We chose the term ”Occam's Razor” for this section of the Cryme-ology due to all the decades-long chatter in the self-help groups that Chronic Fatigue Syndrome was due to some mysterious, unknown virus. Eight 8 million people in the USA have Fibromyalgia (says the NIH) and 4 million have Chronic Fatigue Syndrome (CFIDS, says the NIH) and for decades the Lyme Cabal said non-Dearborn Lyme was CFIDS and Fibro, ... and if OspA caused the same immunosuppression/AIDS-like outcome as Chronic Lyme as the Cabal members themselves claimed, ... and if the commonest thing reactivated in immunosupression is Epstein-Barr and its brothers, Cytomegalovirus, HHV-6, as well as Coxsackie (Foot-and-Mouth Disease), etc., … and if the NIH had a “Lyme and MS group, “ at the National Institute of Neuroological Disorders and Stroke (NINDS) and who now say Lyme and LYMErix activated EBV (or whatever we’re thinking is the combination of herpes viruses that are responsible for MS) via immunosuppression,.... and who say that OspA vaccination alone causes the exact same disease as Chronic Lyme, Chronic Fatigue Syndrome and Fibromyalgia, … and if the NIH now says post-sepsis syndrome is characterized by reactivated EBV and CMV, etc., ... then Chronic Lyme, Chronic Fatigue, and Fibromyalgia are probably not due to some mysterious, unknown virus. ”Medicine” defaulted. No “doctors” were involved in this discovery. They have left a power and authority vacuum. Therefore, we, SASH, are taking over medical science and science reporting, because Simple Things are Big Data. As you have seen, we present a new style of science reporting where the references are built into the text rather than footnoted so you can follow the crimes and fraud exactly. ”Science,” “doctors” and the “journals” all defaulted. There are 30 million people in the United States alone with Fibromyalgia, Lyme, chronic fatigue syndrome, etc., …and all we get is the various explanations that involve VooDoo witch magic with the self-backfiring incantations (“somatoform”), etcetera etcetera nonsense. "The goal of this new manual, as with all previous editions, is to provide a common language for describing psychopathology. While DSM has been described as a “Bible” for the field, it is, at best, a dictionary, creating a set of labels and defining each. The strength of each of the editions of DSM has been “reliability” – each edition has ensured that clinicians use the same terms in the same ways. The weakness is its lack of validity. Unlike our definitions of ischemic heart disease, lymphoma, or AIDS, the DSM diagnoses are based on a consensus about clusters of clinical symptoms, not any objective laboratory measure. In the rest of medicine, this would be equivalent to creating diagnostic systems based on the nature of chest pain or the quality of fever. Indeed, symptom-based diagnosis, once common in other areas of medicine, has been largely replaced in the past half century as we have understood that symptoms alone rarely indicate the best choice of treatment. .. Patients with mental disorders deserve better..."
We take what the editor of the Lancet and Thomas Insel say to be true. Medical science today is just too much malarkey and mentally incompetent. Consider the New Great Imitator. That’s a lot of diseases under one umbrella. Multiple Sclerosis, Fibromyalgia, Lupus, Chronic Fatigue Syndrome, Dementia, Rheumatoid Arthritis, CANCER, Stroke (BTW, LYMErix also caused strokes and "vascular events" also), ALS, … and “after 30 40 years we have nothing,” – Willy Burgdorfer in the “Under Our Skin,” movie. DR. DATTWYLER: "I see a lot of patients, and I must say that treatment resistance lyme arthritis in our center is low, it is very rare. We see maybe one case a year. And, you know, that is using very strict criteria, saying that the person had, you know, CDC criteria for seropositivity, good history, and usually is monoarticulate knee arthritis." Dattwyler sees about uno cases a year. There aren’t very many Dearborn, CDC, 2-tiered positive cases of “Lyme disease.” There never were. It was never about arthritis. Neither the disease nor the OspA vaccine trial results were ever really about arthritis. What “Lyme disease” is really about (and LYMErix too), is much, much worse. FORTY years down the drain. No one is getting better thanks to too much research fraud, and downright stupidity (definition: willful ignorance) and a quack squad of various tooty-frooty “treatment” flavors. We can’t believe the science. We can’t believe how science is reported. We can’t believe the FDA never looked at the Dearborn case definition (they told us so). This is the reason Senator Richard Blumenthal and company had to have the Office of Budget and Management ORDER the FDA to assure the Lyme testing is valid according to the FDA’s rules on the validation of an analytical method. J Clin Microbiol. 1992 Dec;30(12):3158-62. Comparison of whole-cell antibodies and an antigenic flagellar epitope of Borrelia burgdorferi in serologic tests for diagnosis of Lyme borreliosis. Magnarelli LA1, Fikrig E, Berland R, Anderson JF, Flavell RA. That was 1991 and 1992. Fikrig and Flavell own (patented) that test (US # 5,618,533). They own the LYMErix patent,… and they own this method, the only FDA-valid test to assess it. But they very clearly did not use a valid test to assess LYMErix. We know why. Molecular characterization of the humoral response to the 41-kilodalton flagellar antigen of Borrelia burgdorferi, the Lyme disease agent. Berland R1, Fikrig E, Rahn D, Hardin J, Flavell RA. Yale did not use their valid test, above, to assess for the efficacy of LYMErix because it was known by 1993 that Lyme was causing a disease like chronic neurologic Lyme, and therefore was not “safe” or efficacious. The NIH’s Lyme-And-MS Division of NINDS found and reported in 2006 that exposure to the fungal antigens exported by Borrelia like OspA (blebbing) can turn off the function of the TLR5 receptor that handles flagellin as well as tolerizes to other fungal antigens (or TLR2/1 agonists) as you have previously seen and we’ll reference again. 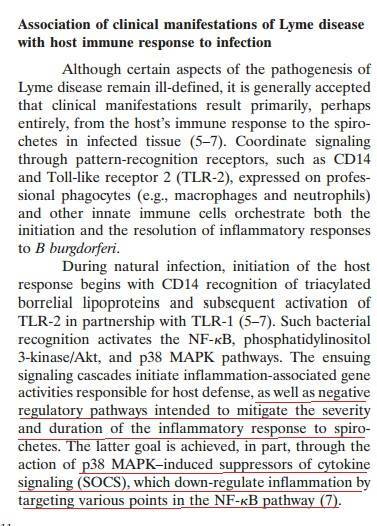 Because TLR2/1 agonism seems to cause cross-tolerance to other TLRs-agonists, this could be the reason some Lyme victims are totally seronegative (no antibodies against Lyme at all). IMPORTANTLY, these two, Martin and Marques at the NIH’s NINDS’ Lyme and MS Division (note, there was a Lyme and MS Division, and not a Lyme and RA Division), were specifically tasked to discover what on Borrelia caused cross reacting antibodies or T cells against myelin (the definition of MS). What they found was nothing. They found that Lyme and OspA caused MS via immunosuppression in the body (humoral) with chronic brain inflammation, and hypothesized that this could be due to the reactivation of EBV and others in the brain (NYTimes, Jane Brody article, below). J Neuropathol Exp Neurol. 2006 Jun;65(6):540-8. Borrelia burgdorferi Induces TLR1 and TLR2 in human microglia and peripheral blood monocytes but differentially regulates HLA-class II expression. Cassiani-Ingoni R1, Cabral ES, Lünemann JD, Garza Z, Magnus T, Gelderblom H, Munson PJ, Marques A, Martin R.
J Infect Dis. 2006 Mar 15;193(6):849-59. Epub 2006 Feb 8. Cabral ES1, Gelderblom H, Hornung RL, Munson PJ, Martin R, Marques AR. Recall from the DNA Shell Game and Biomarkers charge sheets that the bogus Klempner long term non-retreatment study where 2/3rds of his victims had never had IV ceftriaxione before - the standard of care at the time -, and which was assessed with the non-scientifically valid FIQ or Fibromyalgia Impact Questionaire ("questionaires" or "check lists" mean psychiatry is the dominant assessment criteria for a real medical illness), when the IDSA/CDC Lyme crooks were the authors of all the scientifically valid physiological biomarkers of brain and CNS destruction, was based on the inclusion/exclusion criteria of the fraudulent Dearborn case definition, rendering the entire study invalid. Yet, this Klempner report is the basis of the IDSA 2001 and 2006 "guidelines" on the non-diagnosis and non-treatment of Lyme disease. Therefore once the fraud of the Dearborn event is prosecuted, out go all of IDSA's "guidelines." Clin Infect Dis. 2006 Nov 1;43(9):1089-134. Epub 2006 Oct 2. Go ahead and read ^^^ that for all the ridiculousness and false statements they make and in which they repeatedly quote their own previous research fraud. This is called a circle jerk in the common vernacular you’re welcome but we all know it. J Infect Dis. 1992 Aug;166(2):440-4. Georgilis K1, Peacocke M, Klempner MS.
Spirochetal diseases are not curable, and spirochetal infections are un-eradicable. But the disease, the illness, is caused by the immune damage by spirochetes invading the lymph nodes, destroying the B cell germinal centers (Baumgarth and Barthold), as well as the shed fungal antigens on the blebs render the immune system totally inert. This is like AIDS, or an acquired immune deficiency. It’s called post-sepsis syndrome. As you will see later in this report (G., below) Mark Klempner and Gary Wormser re-state that there are 2 kinds of Lyme: the HLA-linked hypersensitivity "one case a year" bad-knee only, and everyone else, the 85% left out of the Dearborn case definition - the definition that includes the Triad of Fatigue, Musculoskeletal signs, and Neurocognitive deficits -, all well known long term outcomes of Sepsis. Since the Dearborn "case definition" only describes and refers to the HLA-linked, arthritis associated "monoarticular arthritis and no other illness signs," the "guidelines" only apply to people with that genetic background. The guidelines are actually a form of racial discrimination. Only the people with the HLAs for arthritis are allowed to have a “disease.” The rest of us are slandered and libeled (see “Deprivation of Rights under Color of Law”). “It was recommended that an IgM immunoblot be considered positive if two of the following three bands are present: 24 kDa (OspC)*, 39 kDa (BmpA), and 41 kDa (Fla) (1). This ridiculous research-fraud diagnostic standard, Dearborn, requires a person to first have a positive ELISA, which is a screening test that only allows the late Lyme arthritis, autoimmune, HLA- hypersensitivity cases to be detected. J Infect Dis. 1994 Feb;169(2):313-8. 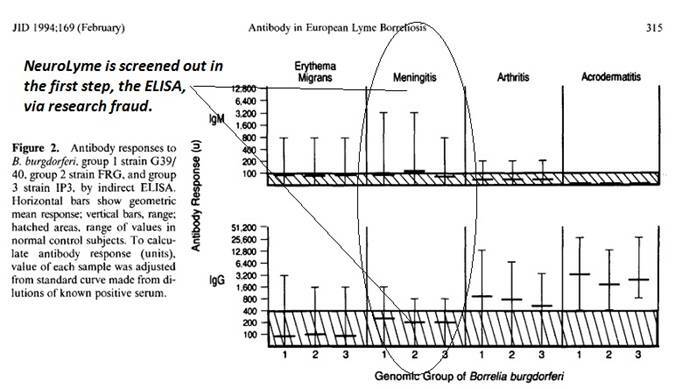 Antibody responses to the three genomic groups of Borrelia burgdorferi in European Lyme borreliosis. Dressler F1, Ackermann R, Steere AC. OspA is specific enough to prevent Lyme, they say, but not specific enough to diagnose? So, while Mark Klempner said at one time that Lyme was incurable due to intracellular spirochetes, now, in the "guidelines" he says there is no such thing as neurologic Lyme. The reason these criminals do not want anyone diagnosed with Lyme disease, in whatever form, is because antibiotics don't cure it. It is an AIDS-like disease, with reactivated viral infections, and most accurately called Post Sepsis syndrome or Endotoxin Tolerance,... with the multiple herpes virus reactivation, fungal antigen tolerance and B cell changes that are like mutations or pre-cancerous. The FIRST and MAIN REASON, for this Lyme-fraud-in-perpetuity, is that the LYMErix or OspA vaccines caused the same Post-Sepsis Syndrome, or Endoxin Tolerance or AIDS-like disease - with the Chronic Fatigue Syndrome (Yale and Steere) or/and Fibromyalgia (Steere) being predominant features -, being a worse fungal toxin for humans than lipopolysaccharide or LPS (TLR4 agonist) and they lied about this to the FDA and to the public and in the journals. The second reason is that the mechanisms of illness in Lyme and CFIDS betray the mechanisms of the Autism pandemic. There are other examples of research fraud in this report perpetrated by CDC officers, particularly Suzanne Vernon, as you will see. A "stealth disabler" would have the same definition: no antibodies, or makers of classic "inflammation," or allergy or hypersensitivity or "autommunity" (they all basically mean the same thing). If you wanted to create a biowewapon against a certain racial population, you would look to see if there are low- to no- genetic HLA links to a hypersensitivity response in that population. This scam is GAME OVER at this point; all that remains are the prosecutions. You will see many times in this report, that OspA never could have been a vaccine – which is the entire point, really, of this report. It was the complete opposite. It was a fungal toxin that caused generalized immunosuppression. You will see that spirochetes and Epstein Barr hang out together in the lymph nodes. You will see that OspA, spirochetes shedding OspA, and Epstein-Barr inhibit apoptosis. That seems to be the first step in all dysimmunity outcomes: Inhibition of Apoptosis of an infected cell. The Cabal has done nothing besides attack their victims since the early 1990s in order to maintain the PRETENSE - a false position (that being that Dearborn was real, that “Steere in Europe” falsifying the testing was not research fraud, that OspA “vaccines” were not research fraud) - that the Dearborn case definition of "Lyme is just a bad knee with no other illness signs," was real and not a crime scene because they do not want to go to jail. As an aside, maybe we should say this now: If the treatment fits the model the science presents, Rituximab, with its 2/3rds' cure rate in Chronic Fatigue Syndrome, it must be a pretty close model. You’ve heard of an Occam’s Razor by now. It’s the principle that the simplest explanation is usually the correct one. ‘If you hear hoofbeats, think ‘horses,’ not ‘zebras.’” “If it quacks like a duck…etc.” Don’t overthink this stuff. It’s all there. You just have to look at the big picture. I. Start with the most compelling data; Yale/CDC Lyme perps did a 180 on everything (Much of this you have already seen). 1) The CDC, IDSA and Yale claim that only the HLA linked arthritis cases were allowed to be called “Lyme disease.” This is the Dearborn, 1994 but current “case definition.” The 2005 Klempner and Wormser HLA report re-stated that the case definition was HLA-linked and the victims had no other illness signs but arthritis. So, that’s the only “case” of Lyme one is allowed to have. It means you may have arthritis, only; an HLA-linked hypersensitivity response with lots of antibodies, and no fatigue or meningitis or anything else. The other symptom set people, the non-HLA linked people, well, that’s a mystery, right? Must be psychiatric. 2) But this definition came after the same people claimed Lyme caused everything (MS, Lupus, ALS, dementia, stroke, Chronic Fatigue Syndrome, Fibromyalgia, etc. ), particularly that chronic neurologic Lyme was incurable in half the cases (Dattwyler, Luft, Sigal, Steere, in 1989 IDSA Review special supplement on Lyme and Spirochetal diseases), and that spirochetal diseases were incurable, even with ceftriaxone, even when there were no human cells for the spirochetes to hide in (Klempner, 1992). 3) At that time, in the 1989 IDSA Reviews, a one Paul Duray, pathologist for Yale, the US Army, the National Cancer Institute, etc, found that the immune cells in the spinal fluid of chronic neurologic looked like immature-, and mutated, or neoplastic or EBV-transformed. Look those words up, “EBV-transformed” or “EBV-immortalized” cells is a known thing and very relevant to the OspA crime. CAUTION: If the reader is not familiar with what “EBV transformed” means, please study the topic and do not make assumptions based on no background. Ever. 4) The OspA vaccine victims were acquiring the same “multi-system,” (Dave Persing), “protean” (Ben Luft) disease manifestations that the Cabal threw out of the case definition at Dearborn. The Chronic Fatigue Syndrome, the Fibromyalgia, the chronic systemic disease with dementia signs and neurological signs, etc,. co-definitions or known (Great Imitator) were outcomes thrown out of the vaccine trial results and described as “Unconfirmed Lyme.” Those cases were not counted as vaccine failures. MS and Lupus are not “solely a monoarticular arthritis with a high antibody concentration against Borrelia with no other symptoms” – the current CDC, Dearborn “case definition.” Says them. So, we get a variety show of autoimmune diseases out of Borreliosis, plus all the slander and libel waste basket cases, don’t we? It only makes sense if you know what OspA is/does. It’s Pam3Cys or a triacylated lipoprotein, the degree of acylation is equated with its toxicity. So what is acylation? It’s the zig-zaggy lines that mean Carbon-Carbon-Carbon, yes, hydrocarbons, like margarine or octane. Exactly, the name just refers to the number of carbons in each carboxyl or acyl group. Palmitic (the Pam in Pam3Cys) has X number of carbons, gasoline, 8, linoleic acids, like 14. Look up what are alkanes then add a COOH group and you have one of these fatty acids. The likes of OspA is on these blebs. They go to the brain, inflame it, get eaten up by immune cells - which renders them incompetent-, they go to the kidneys (LUAT), etc. You will find this to be so in an NIH-owned patent (5,217,872) and elsewhere. So, the fungal antigens are on the shed blebs and they go everywhere and they render the immune cells incompetent, resulting in an AIDS like disease. Everyone who has Lyme disease also has LYMErix disease. J Proteome Res. 2011 Oct 7;10(10):4556-66. doi: 10.1021/pr200395b. Epub 2011 Sep 13. Yang X1, Promnares K, Qin J, He M, Shroder DY, Kariu T, Wang Y, Pal U. "Although we uncovered the existence of at least 10 distinct OM complexes harboring several unique subunits, the complexome is dominated by the frequent occurrence of a limited diversity of membrane proteins, most notably P13, outer surface protein (Osp) A, -B, -C, and -D and Lp6.6." The thing you should be doing, now that establishment medicine and all the universities have basically defaulted on the BigPicture (20-30 million people disabled from the incompetent witch phenomenon, somatoformia), is follow up on these reports in PubMed, and “See Related” articles, and “See Cited by” articles and do your own research. Don’t be afraid to take your time to develop the vocabulary; use multiple sources for basic biology and chemistry facts. By using multiple sources, you’ll capture some sources that use a language set you already have. Then you can cross over and back to other sources until the picture is clearer for you. And VERIFY, VERIFY, VERIFY. Don’t be afraid. There are no experts. III. THE EVIDENCE. And now some of the Alphabet, A-to-the-Double-Alphabet, which all point to, well, LYMErix was never a vaccine and caused the same immunosuppression disease as Chronic Lyme. What are the common opportunistics we see emerge in ALL immunosuppression cases? A. 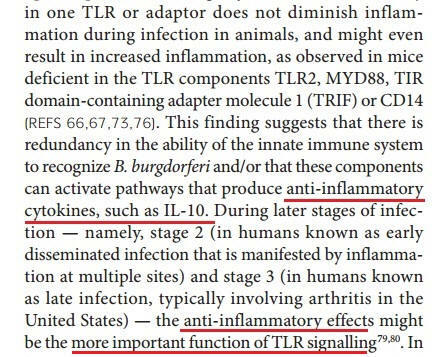 Here next we see Brucella and its TLR2/1 agonist antigens do the same thing: turning off the immune response and causing immunosuppression or producing no antibodies. MHC II or HLA molecules deliver antigens to the surface of the immune cell against which antibodies will be made. If, along comes a TLR2/1 agonist, in time, this function stops. No more antigen is presented, no more antibodies will be made. There are multiple explanations for this mechanism but we have a “THE LIST” at the end of this report with researchers who present information on mechanisms of TLR2-agonist related immunosuppression. Use your search feature to look for “MHC” elsewhere in this report. PLoS One. 2012; 7(11): e50214. Nat Rev Microbiol. 2010 Apr;8(4):296-307. doi: 10.1038/nrmicro2321. ”Several studies have demonstrated that M. tuberculosis-infected macrophages have decreased MHC class II molecule expression and decreased antigen presentation, reducing CD4+ T cell recognition of infected macrophages20,22–24,30,32–38. Comparison of the T cell responses to model antigens presented by M. tuberculosis-infected macrophages and to antigens presented by uninfected macrophages showed that M. tuberculosis reduced antigen presentation by macrophages 12–18 hours or more after infection32,35. "Recent studies have provided insights into the molecular mechanisms involved in the inhibition of MHC class II antigen presentation by M. tuberculosis. Viable M. tuberculosis is not required for inhibition of macrophage MHC class II expression and antigen presentation, which can be achieved by exposure of macrophages to M. tuberculosis lysate22,30,33–35,39. Biochemical fractionation was used to identify M. tuberculosis components that inhibited MHC class II molecule expression, and several M. tuberculosislipoproteins, including LpqH32, LprG40 and LprA41, were found to be key inhibitors. These lipoproteins, as well as PhoS1 (also known as PstS1), are agonists of TLR2 (REFS 23,32,40–43) (TABLE 1), and their inhibition of MHC class II molecule expression and antigen presentation is dependent on TLR2 and its adaptor, myeloid differentiation primary-response protein 88 (MYD88)19,23,32,40. Furthermore, MHC class II inhibition that is mediated by viable M. tuberculosis is itself also largely dependent on TLR2 (REFS23,32) and, to an even greater degree, on MYD88 (REF. 23), although some MHC class II inhibition might be due to non-lipoprotein components of M. tuberculosis and could be MYD88 independent18,19,21. "Thus, prolonged TLR2 signalling induced by M. tuberculosis lipoproteins (and, potentially, by other TLR2 agonists expressed by M. tuberculosis18) results in inhibition of MHC class II molecule expression and antigen presentation by M. tuberculosis-infected macrophages." J Immunol. 2001 Jul 15;167(2):910-8. Noss EH1, Pai RK, Sellati TJ, Radolf JD, Belisle J, Golenbock DT, Boom WH, Harding CV. Sounds like post-sepsis syndrome via fungal antigen tolerance to me. In the beginning of this report, you al;so saw Harding talk about how exposure to TLR2 agonists like fungal lipopeptides also cause cross tolerance to the TLRs that handle viruses, TLRs 7 and 9 and proposed that exposure to too much fungal OspA might render you incompetent to the likes of the common, latent herpes viruses. Fungal antigens cause immunosuppression and not antibodies against Borrelia, particularly not OspA. Not TLR2/1 agonists. Not Pam3Cys. No. It does not result in antibodies. Period. You have this outcome if you have “chronic Lyme.” OspA never could have been a vaccine. Clearly Yale falsified their LYMErix vaccine results. And Dearborn, with the requirement for high antibody production, is research fraud. Lyme Osps, Brucella Omps, and Mycobacteria Lprs…. and several studies say so. Whoever does not know what LYMErix disease is does not know what Lyme disease is. This includes International Lyme and Associated Diseases Society (ILADS.org( and all of the Lyme non-profits. One has to know what the antigen is, in order to know what it does. This is basic science. J Peripher Nerv Syst. 2004 Sep;9(3):165-7. Neuropathy and cognitive impairment following vaccination with the OspA protein of Borrelia burgdorferi. Latov N1, Wu AT, Chin RL, Sander HW, Alaedini A, Brannagan TH 3rd. Int J Risk Saf Med. 2011;23(2):89-96. doi: 10.3233/JRS-2011-0527. Neurological complications of vaccination with outer surface protein A (OspA). It’s not “Autoimmune.” It’s Subimmune. This Subimmunity represents the entire class of the DSM VooDoo Somatoformia – as well as cancer. Cancer is in the Subimmune class, at the other end of the immunity spectrum from Autoimminity. This fact or condition completely flips the entire medical paradigm where you have to have a biomarker that is above-, or more-than- the normal range. Lyme is not an inflammatory disease. There are always negative correlations to biomarkers of autoimmunity or illness or infection except when using sophisticated DNA techniques using spinal fluid, in particular. Henceforth, Autoimmunity will be an obsolete word that connotes the previous Medical Establishment where BigPharma is going to “block” something with their drugs. They are dinosaurs. You can’t block a mechanism that is already permanently blocked and you can’t unblock it. It could be that a person has an HLA-linked outcome to one of the secondary infections like Epstein-Barr or HHV-6, reactivated by the AIDS-like Lyme and LYMErix. Those people would for instance have the official, hypersensitivity outcomes of MS or Lupus or whatever. But they are not also called Incompetent Incantation-ators and they are not mistreated by the entire universe (family, friends, Social Security, “doctors,” everyone, including ILADS and the non profits). Oh, you mean LYMErix causes the same disease as late Chronic Neurologic Lyme (causes post-sepsis syndrome)? G. Wormser and Klempner say there are 2 disease outcomes, Sepsis, and Bad Knees (and you saw the other 3 reports by Wormser and even Steere and CDC’s Paul Mead in the beginning of this report, stating that the immunosuppression might be the more important driver of late, Chronic Lyme (post-sepsis). J Infect Dis. 2005 Sep 15;192(6):1010-3. Epub 2005 Aug 4. A case-control study to examine HLA haplotype associations in patients with posttreatment chronicLyme disease. Klempner MS1, Wormser GH, Wade K, Trevino RP, Tang J, Kaslow RA, Schmid C.
"Lyme disease is caused by infection with the tickborne bacterium Borrelia burgdorferi. Antibiotic treatment is highly effective for the acute symptoms of Lyme disease and is also effective for late septic manifestations . … There appear to be at least 2 distinct syndromes in patients with persistent symptoms after antibiotic treatment. One syndrome has localized symptoms that are similar to pretreatment symptoms. Patients with this syndrome often have recurrent episodes of arthritis/synovitis. Results of synovial fluid cultures and polymerase chain reaction (PCR) for B. burgdorferi are negative . Patients generally feel well aside from their arthritis symptoms. So, there are 2 distinct diseases: Arthritis (“one case a year” - Dattwyler), and the other thing – the chronic neurologic. The first thing, where people do not feel sick, is a Dearborn “case” of Lyme. But, these criminals claim, those chronic neurologic cases are not sick from B. burgdorferi. "The 19-kD antigen is a cell wall-associated lipoprotein present in Mycobacterium tuberculosis and in bacille Calmette-Guérin (BCG) vaccine strains. Expression of the 19-kD antigen as a recombinant protein in two saprophytic mycobacteria-M. vaccae and M. smegmatis-resulted in abrogation of their ability to confer protection against M. tuberculosis in a murine challenge model, and in their ability to prime a DTH response to cross-reactive mycobacterial antigens. Induction of an immune response to the 19-kD antigen by an alternative approach of DNA vaccination had no effect on subsequent M. tuberculosis challenge. These results are consistent with a model in which the presence of the 19-kD protein has a detrimental effect on the efficacy of vaccination with live mycobacteria. Targeted inactivation of genes encoding selected antigens represents a potential route towards development of improved vaccine candidates." Mycobacterium tuberculosis 19-kilodalton lipoprotein inhibits Mycobacterium smegmatis-induced cytokine production by human macrophages in vitro. “Vaccination of mice with Mycobacterium vaccae or M. smegmatis induces some protection against M. tuberculosis challenge. The 19-kDa lipoprotein of M. tuberculosis, expressed in M. vaccae or M. smegmatis (M. smeg19kDa), abrogates this protective immunity. To investigate the mechanism of this suppression of immunity, human monocyte-derived macrophages (MDM) were infected with M. smeg19kDa. Infection resulted in reduced production of tumor necrosis factor alpha (TNF-alpha) (P < 0.01), interleukin-12 (IL-12) (P < 0.05), IL-6 (P < 0.05), and IL-10 (P < 0.05), compared to infection with M. smegmatis vector (M. smegV). Infection with M. smeg19kDa and with M. smegV had no differential effect on expression of costimulatory molecules on MDM, nor did it affect the proliferation of presensitized T cells cocultured with infected MDM. When MDM were infected with M. smegmatis expressing mutated forms of the 19-kDa lipoprotein, including non-O-glycosylated (M. smeg19NOG), nonsecreted (M. smeg19NS), and nonacylated (M. smeg19NA) variants, the reduced production of TNF-alpha or IL-12 was not observed. When the purified 19-kDa lipoprotein was added directly to cultures of infected monocytes, there was little effect on either induction of cytokine production or its inhibition. Thus, the immunosuppressive effect is dependent on glycosylated and acylated 19-kDa lipoprotein present in the phagosome containing the mycobacterium. These results suggest that the diminished protection against challenge with M. tuberculosis seen in mice vaccinated with M. smegmatis expressing the 19-kDa lipoprotein is the result of reduced TNF-alpha and IL-12 production, possibly leading to reduced induction of T-cell activation." The Mycobacterium tuberculosis recombinant 27-kilodalton lipoprotein induces a strong Th1-typeimmune response deleterious to protection. Ann N Y Acad Sci. 1988;539:103-11. Modulation of natural killer cell activity by Borrelia burgdorferi. Golightly M1, Thomas J, Volkman D, Dattwyler R.
"..when lymphocytes are cultured in the presence of growing Bb there is a marked inhibition ( p < .0005 ) of NK activity on days 3, 5, and 7 when compared to lymphocytes cultured in BSKII media in the absence of spirochetes. This effect is not due to a selective depletion or or toxicity to endogenous NK since viability studies and monoclonal antibodies demonstrate no significant changes after culture with the organism. "The inhibition is directly attributable to the organism or its supernatants (data not shown)." Borrelial lipids cause immunosuppression, is what he is saying. Rheum Dis Clin North Am. 1989 Nov;15(4):747-55. PLoS Pathog. 2015 Jul 2;11(7):e1004976. doi: 10.1371/journal.ppat.1004976. eCollection 2015. Elsner RA1, Hastey CJ1, Olsen KJ2, Baumgarth N3. So Lyme infection renders you unable to handle viral infections. This seems to have to do with damaged B cell maturation centers. We wonder if what Baumgarth found has anything to do with Duray’s findings that we have EBV-transformed lymphocytes in our spinal fluid, and whether all the biomarkers of central nervous system disease associated with Lyme (discovered by the Cabal) has more to do with these secondary opportunistics…. ?? Once more (you’ve just seen 5+ examples), lipoproteins and lipoprotein vaccines suppress immunity, even in animals, which are known to have more broad natural immunity than humans (making animals diseases very good sources of human disease bioweapons). Three Tb vaccines based on lipoproteins, Dattwyler, et al, claiming Borrelia oily lipoproteins blunt immunity, and Gary Wormser himself said lipoproteins do that mysterious thing… “blocking of cell cycle phase progression.” Later we will learn OspA inhibits apoptosis, which is the same thing EBV does. That is what “EBV-immortalized” means. The infected cell does not kill itself, or undergo apoptosis as a way of keeping the pathogens from reproducing themselves. J Med Genet. 2002 Mar;39(3):170-7. Fantes JA1, Mewborn SK, Lese CM, Hedrick J, Brown RL, Dyomin V, Chaganti RS, Christian SL, Ledbetter DH. "We identified a fourth pseudogene, BCL8, which maps to the pericentromeric region and is coamplified along with the NF1 sequences. Interphase FISH ordering experiments show that IgH D lies closest to the centromere, while BCL8A is the most distal locus in this pseudogene array;"
‘Sad, really. Pathetic. What we are talking about here is a complete failure in Medicine and Mental Health “Medicine” if you could call mental health, “medicine.” How many people know that the genetic kind of Autism co-confers with NF1, … and that the inhibition of apoptosis is programmed in in Autism and NF1,… and also that the inhibition of apoptosis of immune cells is also acquired by exposure to fungal Osps and the like,… and that the mechanism of inhibiting apoptosis is also hijacked by Epstein-Barr? That’s practically everything you could know about all disease, and sitting right in Yale’s lap. ‘Almost literally. And they threw it all away and chose instead, debauchery and sleaze. OspA-like lipoproteins act like extra BCL2 molecules, inhibiting apoptosis. They gum up the immunity works. They stick to even the membranes of mitochondria, depolarizing it. They stick to red blood cell membranes, also depolarizing them. This is shown in numerous examples of the literature with mycoplasmal and mycobacterial lipoproteins, as well as Brucella lipoproteins. One can use PubMed or the National Library of Medicine Anyone can find out OspA is the basic Pam3Cys molecule. It occurs naturally and is synthetic (Braun lipoprotein). Epstein-Barr has the ability to use human BCL2. The first step in dysimmunity, one could claim, is the inhibition of apoptosis. Fungal lipoproteins, of the TLR2/1 type, highly lipidated, with 3 or more acyl (fatty acid, like palmitic acid or linoleic acid, etc) groups, gum up immunity. They inhibit apoptosis. In particular, OspA is sticky and even sticks to itself. This may be the reason spirochetes appear to cluster in vitro. However they don’t cluster or grow in colonies in humans; biofilms are not the reason antibiotic treatment fails. This data summary and explanation of the science abundantly shows spirochetes and “biofilms” are not what makes Chronic Lyme chronic. Especially not if the vaccine caused the same chronic neurologic disease. J Clin Microbiol. 1991 Apr;29(4):764-72. Morphology of Borrelia burgdorferi: structural patterns of cultured borreliae in relation to staining methods. "The microscopic recognition of Borrelia burgdorferi in biologic fluids and tissues is difficult and challenging because of low numbers of organisms occurring as single isolated spirochetes, the apparent lack of colony formation in tissues, and differing lengths and structural morphologies." Anyone who has a science background, which apparently dis-includes anyone with an ‘MD” after their names has for 15 years been able to discover what exactly OspA was and why it caused systemic disease and why it failed. “When Lyme Disease Lasts and Lasts,” by Jane Brody in the New York Times. And, as you have previously seen, Marques and Martin have stated that it is OspA or borrelial triacyl lipoproteins responsible for all the trouble. The vaccine caused the disease. So what is the vaccine? A fungal endotoxin. You’re shaking your head, right? The NIH supports the Hotchkiss, Washington University report on Sepsis and Post-Sepsis outcomes (see next below). The Cabal claims that what happens after early Lyme is called "Post-Lyme Syndrome," and that that is psychiatric. But actually you saw Klempner call it a Septic event ("G.," above), particularly as regards for the Central Nervous System (CNS). People should be aware that these criminals are the authors of all the scientifically valid signs or BIOMARKERS of CNS degradation (see the other charge sheets). That is why the psychiatric slander, libel and downright genetic discrimination ("No arthritis HLA's? You must be crazy") is a criminal charge, Deprivation of Rights under Color of Law. The biomarkers will probably not be found in the blood, except for reduced cytokines, perhaps. "Patients with lingering sepsis had markedly higher levels of viruses detectable in the blood, compared with the healthy controls and critically ill patients without sepsis. Among the sepsis patients, for example, the researchers found that 53 percent had Epstein-Barr virus, 24 percent had cytomegalovirus, 14 percent had herpes-simplex virus, and 10 percent had human herpes simplex virus-7. "These viruses generally don’t lead to significant illness in people who are healthy but can cause problems in patients who are immune-suppressed. " PLoS One. 2014 Jun 11;9(2):e98819. doi: 10.1371/journal.pone.0098819. eCollection 2014. Reactivation of multiple viruses in patients with sepsis. Walton AH1, Muenzer JT2, Rasche D1, Boomer JS3, Sato B4, Brownstein BH1, Pachot A5, Brooks TL3, Deych E3, Shannon WD3, Green JM3, Storch GA2, Hotchkiss RS1. “Sepsis is the host's non-resolving inflammatory response to infection that leads to organ dysfunction , . A current controversial hypothesis postulates that if sepsis pursues a protracted course, it progresses from an initial primarily hyper-inflammatory phase to a predominantly immunosuppressive state –. Experimental therapeutic approaches in sepsis have almost exclusively focused on blocking early inflammation or host-pathogen interaction and failed –. Recently, immuno-adjuvant therapies that boost host immunity, e.g., GM-CSF and interferon-γ, have been successful in small clinical trials thereby supporting the concept that reversing immunosuppression in sepsis is a plausible strategy to improve outcome , . However, several issues have limited this approach including lack of consensus that immunosuppression is a clinically important phenomenon , , . Also, difficulty in identifying patients with impaired immunity as well as determining optimal timing for administration pose significant challenges to pursuing this approach . While immuno-adjuvant therapies might improve sepsis survival if administered during the later immunosuppressive phase, these agents might worsen outcome if given during the early hyper-inflammatory phase , . Thus, a means to distinguish these two contrasting phases of sepsis is needed not only to verify the hypothesis that sepsis progresses to an immunosuppressive state but also to guide use of potential agents which boost immunity. Q. 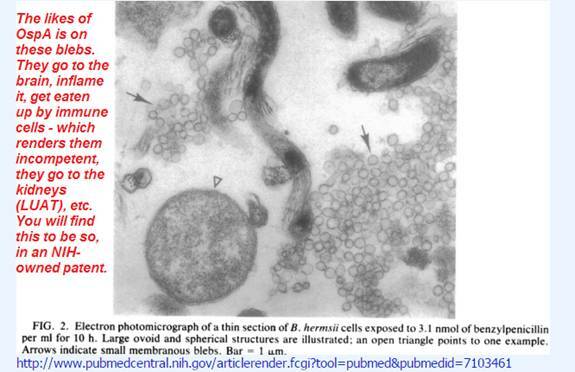 If pathologist Colonel Paul H. Duray (NCI, Yale, US Army Ft. Detrick) were still alive, you could ask him why he said, “these look like Epstein-Barr transformed cells" in the spinal fluid of chronic neurologic Lyme victims in 1989, in IDSA's journal. "Immature B cells can also be seen in the spinal fluid. These cells can appear quite atypical- not unlike those of transformed or neoplastic lymphocytes." Paul Duray, NCI, NIH, Ft. Detrick, at the 1992 Cold Spring Harbor ALDF.com Conference, published in Steve Schutzer's Lyme Disease: Molecular and Immunologic Approaches, book, as previously referenced. R. Patricia K. Coyle, SUNY-SB. Coyle once was the author of several reports and even methods to detect borrelia antigens in the central nervous system because of the absence of antibodies…. now only specializes in Multiple Sclerosis??? That’s Auwaerter (Johns Hopkins), Huber (Tufts), Coyle (SUNY-SB), Duray (NIH, NC) Martin and Marques (NIH, NINDS), all either talking about Lyme and EBV-transformed cells, Lyme and EBV as the real culprit, specializing only in Lyme and EBV, or in Lyme and MS. Think about it. "The present invention pertains to a method for activating the immune system of a patient by intermittently administering interleukin-2 (IL-2) to that patient. Such administration of IL-2 can optionally be combined with other therapies, such as anti-retroviral, anti-bacterial or anti-fungal therapies, suitable for treatment of the patient's condition. This invention also relates to an approach to gene therapy that entails administering IL-2 to a patient so as to facilitate in situ lymphocyte transduction by a retroviral vector also administered to the patient. "....Illustrative of specific disease states in treatment of which the present invention can be applied are HIV infection and other diseases characterized by a decrease of T-cell immunity, for example, mycobacterial infections like tuberculosis and fungal infections such as cryptococcal disease. This method also can be used in the treatment of secondary infections that occur in patients with suppressed immune systems, such as the opportunistic infections that occur in AIDS patients. ..."
"...Opportunistic infections may also be treated using the present invention. For example, AIDS related opportunistic infections are described in Mills et. al. (1990) Scientific American 263:51-57, which is hereby incorporated by reference in its entirety. Mills show that common opportunistic infections are caused by, for example, Cytomegalovirus, Pneumocystis carnii, Candida albicans, Varicella-Zoster virus, Epstein-Barr virus, Toxoplasma gondii, Mycobacterium avium, Cryptococcus neoformans. It is envisioned that IL-2 may be administered along with other compounds used to treat infectious diseases or other diseases. Examples of other agents include antifungal, antiviral, or antibacterial drugs. Additionally, IL-2 may be administered in combination with other efficacious cytokines. For example, combination therapy may include IL-2 with GM-CSF, G-CSF, M-CSF, IL-3, IL-12, IL-15, a-, b-, or g-interferons." U. CDC’s Suzanne Vernon explaining how Epstein-Barr contributes to fatigue; How she committed research fraud to try to say fungal antigens are not involved in fatigue; How we know fungal antigens adhere to erythrocyte membranes causes hypoxic fatigue, stick to internal cell components, depolarizing membranes, etc. BMC Infect Dis. 2006 Jan 31;6:15. Preliminary evidence of mitochondrial dysfunction associated with post-infective fatigue after acute infection with Epstein Barr virus. Vernon SD1, Whistler T, Cameron B, Hickie IB, Reeves WC, Lloyd A. "Those who developed post-infective fatigue had gene expression profiles indicative of an altered host response during acute mononucleosis compared to those who recovered uneventfully. Several genes including ISG20 (interferon stimulated gene), DNAJB2 (DnaJ [Hsp40] homolog and CD99), CDK8 (cyclin-dependent kinase 8), E2F2 (E2F transcription factor 2), CDK8 (cyclin-dependent kinase 8), and ACTN2 (actinin, alpha 2), known to be regulated during EBV infection, were differentially expressed in post-infective fatigue cases. Several of the differentially expressed genes affect mitochondrial functions including fatty acid metabolism and the cell cycle." "CONCLUSION: These preliminary data provide insights into alterations in gene transcripts associated with the varied clinical outcomes from acute infectious mononucleosis." Now, go back to the Primers Shell Game and look at “gene expression” by Chiu and Aucott. Right. If these people were any more full of crap, they’d rival a Pacific Ocean-sized swine lagoon. J Med Microbiol. 2003 Nov;52(Pt 11):1027-8. Absence of Mycoplasma species DNA in chronic fatigue syndrome. Vernon SD, Shukla SK, Reeves WC. Berl Munch Tierarztl Wochenschr. 1992 Nov 1;105(11):380-3. [The effect of Eperythrozoon suis infection on the osmotic fragility of erythrocytes]. Cell Death Differ. 2004 Nov;11(11):1204-12. Mycoplasma fermentans inhibits tumor necrosis factor alpha-induced apoptosis in the human myelomonocytic U937 cell line. Gerlic M1, Horowitz J, Horowitz S.
”In many apoptosis scenarios, including TNF-mediated apoptosis, the mitochondrial inner transmembrane potential (m) collapses.19, 20 To investigate whether the antiapoptotic effect of M. fermentans in TNF-induced apoptosis is upstream or downstream of the mitochondria, we measured the loss in Delta-Sigmam, induced by TNF (20 ng/ml), in infected and noninfected cells. At 24 h post infection, the cultures were stimulated with TNF (20 ng/ml) for 2 h, and each culture was stained with 3,3'-dihexyloxacarbocyanine iodide (DiOC6 (3)) and analyzed by FACS (a typical experiment is shown in Figure 6a). That’s also cute, though, right? CDC throws out the stuff that causes fatigue by inhibiting the Energy Producing subcellular mitochondrial function – the cell’s “powerhouse” – when allegedly looking for it. And these organisms also adhere to erythrocyte membranes, also inhibiting oxygen from transferring across it. IF, Epstein-Barr alone were responsible for Chronic Fatigue Syndrome, then one can see their idiot point of view that “stress” causes the reactivation of Epstein-Barr (“somatiformical” = reactivating EBV) and that de-stressing solves the problem. Maybe that is the case with the somatoformical medical students and astronauts (one of the last criminal charge sheets in this series) and the like, who are so well known to have stress-reactivated Epstein-Barr or mono. But here we see something much more sinister at work. The CDC does not want anyone to know how tolerance to fungi causes irreversible fatigue and how that tolerance spreads to other infections (“common, now, opportunistics”). We think the reason for this CDC tardation has to do with childhood vaccines being contaminated with fungal antigens, which is the reason for Thimerosal in the first place. We think the reason for this fraud on the part of the CDC is that they do not want us to be aware of the common mechanisms at work in vaccines-virus-acquired Autism (brain damage is the more correct term). We think the 20-30 million alleged witches and warlocks (somatoformers) in the country are the price the CDC pays to continue to brain damage around 1:60 (?) children for life. It’s a great bargain for the CDC. They even say “it is a calculated risk,” this vaccines enforcement and the brain-damaged-for-life outcome. CDC does the calculating. You know who all the real Scary People are. Trends Microbiol. 2008 Apr;16(4):173-80. doi: 10.1016/j.tim.2008.02.001. Epub 2008 Mar 18. Staying alive: bacterial inhibition of apoptosis during infection. One of the most important mechanisms of synergy between fungal antigens and viruses – and we have mentioned this many times in our reports and criminal charge sheets against the Cabal -, has to do with tolerance and cross tolerance and we have explained what this means in the past. Tolerance means your body no longer sees the invading pathogen’s components are a threat and stops responding to them immunologically. Cross-tolerance is when an infection with one pathogen or antigen type, renders the immune system incompetent to other types. “Endotoxin Tolerance” is a known thing, known for decades. Endotoxin is considered mainly to be LPS or lipopolysaccharide (feel free to Google the structure or the image) which are TLR4 agonists. TLR4 agonists are not as toxic as the fungal TLR2/1 agonists of say spirochetes, mycoplasma, Brucella, or mycobacteria. You have seen some of this with Clifford Harding and others have proposed other observed the mechanics or function of other intracellular compounds (“in the mileux”) being inhibited, even by Gary Wormser, et al. J Innate Immun. 2016;8(2):171-84. doi: 10.1159/000440838. Epub 2015 Oct 13. Endotoxin Tolerance Inhibits Lyn and c-Src Phosphorylation and Association with Toll-Like Receptor 4 but Increases Expression and Activity of Protein Phosphatases. Xiong Y1, Murphy M, Manavalan TT, Pattabiraman G, Qiu F, Chang HH, Ho IC, Medvedev AE. “Endotoxin tolerance protects the host by limiting excessive 'cytokine storm' during sepsis, but compromises the ability to counteract infections in septic shock survivors. It reprograms Toll-like receptor (TLR) 4 responses by attenuating the expression of proinflammatory cytokines without suppressing anti-inflammatory and antimicrobial mediators, but the mechanisms of reprogramming remain unclear. In this study, we demonstrate that the induction of endotoxin tolerance in human monocytes, THP-1 and MonoMac-6 cells inhibited lipopolysaccharide (LPS)-mediated phosphorylation of Lyn, c-Src and their recruitment to TLR4, but increased total protein phosphatase (PP) activity and the expression of protein tyrosine phosphatase (PTP) 1B, PP2A, PTP nonreceptor type (PTPN) 22 and mitogen-activated protein kinase phosphatase (MKP)-1. Chemical PP inhibitors, okadaic acid, dephostatin and cantharidic acid markedly decreased or completely abolished LPS tolerance, indicating the importance of phosphatases in endotoxin tolerization. Overexpression of PTPN22 decreased LPS-mediated nuclear factor (NF)-x03BA;B activation, p38 phosphorylation and CXCL8 gene expression, while PTPN22 ablation upregulated LPS-induced p65 NF-x03BA;B and p38 phosphorylation and the expression of TNF-α and pro-IL-1β mRNA, indicating PTPN22 as an inhibitor of TLR4 signaling. Thus, LPS tolerance interferes with TLR4 signaling by inhibiting Lyn and c-Src phosphorylation and their recruitment to TLR4, while increasing the phosphatase activity and expression of PP2A, PTPN22, PTP1B and MKP1. A person who knows how to use the National Library of Medicine can follow up on all this. The NIH endorses it, as you have seen. And it's pretty ridiculous that IDSA thinks they can maintain the ruse that OspA was a vaccine and Lyme is only about a bad knee with these hundreds of reports that say the complete opposite is true. Some say yes, some say no, some say Cytomegalovirus, some say HHV-6, some say an EBV reactivated HERV, some say it’s more than one herpes, and some say Viola! what do you know, immunosuppression from malaria seems to be associated with EBV-associated Burkitt’s Lymphoma. Synergy. Another kind of another in-parallelism to our model. One infection invites the other, such as when in the old days it was known a cold virus could result in a dual bacterial infection and they gave children antibiotics to prevent a secondary ear infection. Or when in 1918 we had Spanish Flumonia, wherein one infection invited the other. Regardless, it seems to be unsettled as to which common virus or which two or which three, but it does seem to be a consensus that the herpesviruses are associated with MS.
You’ve seen NINDS basically settle on EBV, maybe HHV-6, too. It’s something though, and like Chronic Fatigue Syndrome and Fibromyalgia and Lupus and all the other autoimmune and non-immune outcomes, they ALL start with a viral-like illness, people claim. There are 2 outcomes. Autoimmune and non-immune. The latter are not recognized, but Anthony Fauci, head if NIAID (National Institute of Allergy and Infectious Diseases) mentions it in his patent. Y. What is Bell’s Palsy caused by? Some say EBV, some say Varicella, some say Simplex… Maybe it’s not spirochetes, maybe it is spirochetes, maybe it is a herpesvirus, maybe it is a combination of herpesviruses, maybe it is herpesviruses and spirochetes. But given that more than one kind of spirochete is associated with Alzheimer’s, and given that immunosuppression diseases are reactivation of COMMON VIRUSES, well, maybe that is the reason ILADS can’t cure anyone. They don’t know what they’re doing and willfully do not look at the big picture. PLoS One. 2011;6(10):e26358. doi: 10.1371/journal.pone.0026358. Epub 2011 Oct 19. Fluge Ø1, Bruland O, Risa K, Storstein A, Kristoffersen EK, Sapkota D, Næss H, Dahl O, Nyland H, Mella O.
PLoS One. 2015 Jul 1;10(7):e0129898. doi: 10.1371/journal.pone.0129898. eCollection 2015. B-Lymphocyte Depletion in Myalgic Encephalopathy/ Chronic Fatigue Syndrome. An Open-Label Phase II Study with Rituximab Maintenance Treatment. Fluge Ø1, Risa K1, Lunde S1, Alme K1, Rekeland IG1, Sapkota D2, Kristoffersen EK3, Sørland K1, Bruland O4, Dahl O5, Mella O5. Could be about bad B cells, since the treatment fits the model. Ya think? Remember now, Lyme causes Chronic Fatigue Syndrome and Fibromyalgia, says the Cabal. And 12 million people in the United States alone have those… things. So it can’t be anything too mysterious if it also causes Lupus and MS and the Uncle Sam of Tardmerica ignores it. AA. The Yale "Lupus and Lyme Clinic"
The NIH used to have an MS-Lyme section of the NINDS, and Yale used to have a “Lyme and Lupus Clinic” before that became the criminal entity “L2 Diagnostics,” led by none other than Robert Schoen of “we can’t tell LYMErix apart from multisystem late Lyme” infamy. J Neurol Sci. 1993 Jul;117(1-2):206-14. Reactivity of neuroborreliosis patients (Lyme disease) to cardiolipin and gangliosides. García Moncó JC1, Wheeler CM, Benach JL, Furie RA, Lukehart SA, Stanek G, Steere AC. J Immunol. 2004 Jan 15;172(2):1287-94. Defective control of latent Epstein-Barr virus infection in systemic lupus erythematosus. Kang I1, Quan T, Nolasco H, Park SH, Hong MS, Crouch J, Pamer EG, Howe JG, Craft J.
PLoS One. 2014 Jan 28;9(1):e87528. doi: 10.1371/journal.pone.0087528. eCollection 2014. A20 is critical for the induction of Pam3CSK4-tolerance in monocytic THP-1 cells. Hu J1, Wang G2, Liu X1, Zhou L3, Jiang M1, Yang L4. "A20 functions to terminate Toll-like receptor (TLR)-induced immune response, and play important roles in the induction of lipopolysacchride (LPS)-tolerance. However, the molecular mechanism for Pam3CSK4-tolerance is uncertain. Here we report that TLR1/2 ligand Pam3CSK4 induced tolerance in monocytic THP-1 cells. The pre-treatment of THP-1 cells with Pam3CSK4 down-regulated the induction of pro-inflammatory cytokines induced by Pam3CSK4 re-stimulation. Pam3CSK4 pre-treatment also down-regulated the signaling transduction of JNK, p38 and NF-κB induced by Pam3CSK4 re-stimulation. The activation of TLR1/2 induced a rapid and robust up-regulation of A20, suggesting that A20 may contribute to the induction of Pam3CSK4-tolerance. This hypothesis was proved by the observation that the over-expression of A20 by gene transfer down-regulated Pam3CSK4-induced inflammatory responses, and the down-regulation of A20 by RNA interference inhibited the induction of tolerance. Moreover, LPS induced a significant up-regulation of A20, which contributed to the induction of cross-tolerance between LPS and Pam3CSK4. A20 was also induced by the treatment of THP-1 cells with TNF-α and IL-1β. The pre-treatment with TNF-α and IL-1β partly down-regulated Pam3CSK4-induced activation of MAPKs. Furthermore, pharmacologic inhibition of GSK3 signaling down-regulated Pam3CSK4-induced A20 expression, up-regulated Pam3CSK4-induced inflammatory responses, and partly reversed Pam3CSK4 pre-treatment-induced tolerance, suggesting that GSK3 is involved in TLR1/2-induced tolerance by up-regulation of A20 expression. Taken together, these results indicated that A20 is a critical regulator for TLR1/2-induced pro-inflammatory responses." TLR2/1-induced tolerance or LYMErix or Lyme tolerance is a thing, like Endotoxin Tolerance, only worse, since so far it is not reversible. In other words, IDSA and the CDC have no idea what they are talking about, and this concerns every major disease, if not every disease. The influence of toll-like receptor stimulation on expression of EBV lytic genes. Siennicka J1, Trzcińska A2, Cześcik A2, Dunal-Szczepaniak M2, Lagosz B2. "Epstein-Barr virus (EBV) establishes latency in the resting memory B-cell compartment. It has been recently suggested that maintenance of chronic infection is dependent on periodic reactivation. Although the stimuli for EBV reactivation in vivo during natural infections are largely unknown, there is evidence indicating that heterologous infections could trigger herpesviruses reactivation. The purpose of this work was to identify the influence of Toll-like receptors stimulation on EBV replication in EBV latently infected Burkitt lymphoma cells (P3HR-1, Raji and Namalwa). The cells were stimulated with Pam3CSK4 (synthetic triacylated lipoprotein), PolyI:C (synthetic analog of dsRNA), LPS (lipopolysaccharide from E.coli), measles virus (MeV) and PMA (phorbol myristate acetate). Non-stimulated cells (NS) served as control. EBV expression was investigated at mRNA level for three viral lytic genes: BZLF1 (immediate early, ZEBRA), BALF2 (early, EA) and BcLF1 (late, VCA). Additionally, the effect of stimulation on NF-kBp65 and inflammatory cytokines (IL-lb, IL-6, IL-8, IL-10, IL-12p70, and TNF) was investigated. Stimulation of TLRs led to limited changes in EBV expression manifesting as increase of ZEBRA at mRNA level in cells treated with PolyI:C and Pam3CSK4. Stimulation with PolyI:C, Pam3CSK4 and LPS also lead to considerable increase of NF-kBp65, while increased levels of inflammatory cytokines were observed for IL-8, TNF and IL-6 in cells treated with PMA and MeV. In conclusion, the results of our experiments support the suggestion that TLRs stimulation with microbial ligands influences EBV virus replication." J Immunol. 2009 Feb 15;182(4):1799-809. doi: 10.4049/jimmunol.0802686. Down-regulation of MHC class II expression through inhibition of CIITA transcription by lytic transactivator Zta during Epstein-Barr virus reactivation. Li D1, Qian L, Chen C, Shi M, Yu M, Hu M, Song L, Shen B, Guo N.
The presentation of peptides to T cells by MHC class II molecules is of critical importance in specific recognition to a pathogen by the immune system. The level of MHC class II directly influences T lymphocyte activation. The aim of this study was to identify the possible mechanisms of the down-regulation of MHC class II expression by Zta during EBV lytic cycle. The data in the present study demonstrated that ectopic expression of Zta can strongly inhibit the constitutive expression of MHC class II and CIITA in Raji cells. The negative effect of Zta on the CIITA promoter activity was also observed. Scrutiny of the DNA sequence of CIITA promoter III revealed the presence of two Zta-response element (ZRE) motifs that have complete homology to ZREs in the DR and left-hand side duplicated sequence promoters of EBV. By chromatin immunoprecipitation assays, the binding of Zta to the ZRE(221) in the CIITA promoter was verified. Site-directed mutagenesis of three conserved nucleotides of the ZRE(221) substantially disrupted Zta-mediated inhibition of the CIITA promoter activity. Oligonucleotide pull-down assay showed that mutation of the ZRE(221) dramatically abolished Zta binding. Analysis of the Zta mutant lacking DNA binding domain revealed that the DNA-binding activity of Zta is required for the trans repression of CIITA. The expression of HLA-DRalpha and CIITA was restored by Zta gene silencing. The data indicate that Zta may act as an inhibitor of the MHC class II pathway, suppressing CIITA transcription and thus interfering with the expression of MHC class II molecules. How many “doctors” know you can’t rely on antibody testing to know if EBV has been reactivated? Right, I never met one or heard of one either. Herpesviridae. 2011 Jan 5;2(1):1. doi: 10.1186/2042-4280-2-1. Innate immune modulation in EBV infection. "Dysregulation of EBV-specific immune responses is also characteristic of EBV-associated autoimmune diseases such as rheumatoid arthritis (RA) and systemic lupus erythematosus (SLE). CTL response to EBV infection has been well documented since the discovery of EBV . However, significant progresses in characterizing individual viral proteins involved in evasion of the T cell-mediated adaptive immune response have only been made in the last decade [12-16]. For example, the functional homologue of human IL10, BCRF1, elicits CD8+ T cell responses, and can be processed and presented to CD8+ CTLs through a TAP-independent pathway ." ‘A functional homolog of IL-10, the immune-suppressing cytokine. Awesome. The lytic cycle of Epstein-Barr virus is associated with decreased expression of cell surface major histocompatibility complex class I and class II molecules. Keating S1, Prince S, Jones M, Rowe M.
Human herpesviruses utilize an impressive range of strategies to evade the immune system during their lytic replicative cycle, including reducing the expression of cell surface major histocompatibility complex (MHC) and immunostimulatory molecules required for recognition and lysis by virus-specific cytotoxic T cells. Study of possible immune evasion strategies by Epstein-Barr virus (EBV) in lytically infected cells has been hampered by the lack of an appropriate permissive culture model. Using two-color immunofluorescence staining of cell surface antigens and EBV-encoded lytic cycle antigens, we examined EBV-transformed B-cell lines in which a small subpopulation of cells had spontaneously entered the lytic cycle. Cells in the lytic cycle showed a four- to fivefold decrease in cell surface expression of MHC class I molecules relative to that in latently infected cells. Expression of MHC class II molecules, CD40, and CD54 was reduced by 40 to 50% on cells in the lytic cycle, while no decrease was observed in cell surface expression of CD19, CD80, and CD86. Downregulation of MHC class I expression was found to be an early-lytic-cycle event, since it was observed when progress through late lytic cycle was blocked by treatment with acyclovir. The immediate-early transactivator of the EBV lytic cycle, BZLF1, did not directly affect expression of MHC class I molecules. However, BZLF1 completely inhibited the upregulation of MHC class I expression mediated by the EBV cell-transforming protein, LMP1. This novel function of BZLF1 elucidates the paradox of how MHC class I expression can be downregulated when LMP1, which upregulates MHC class I expression in latent infection, remains expressed in the lytic cycle. Remember, Chiu and Aucott says there is no change to immune genes expression. There is just the down-regulation of all mechanisms related to immune competence in the Post-Sepsis outcome of Lyme and LYMErix disease. Tardmerica may be stupid, but it’s not boring. Semin Cancer Biol. 2008 Dec;18(6):397-408. doi: 10.1016/j.semcancer.2008.10.008. Epub 2008 Oct 25. Epstein-Barr virus evasion of CD8(+) and CD4(+) T cell immunity via concerted actions of multiple gene products. Ressing ME1, Horst D, Griffin BD, Tellam J, Zuo J, Khanna R, Rowe M, Wiertz EJ. Therefore, never use antibody testing to show an association between an illness and an infectious disease. OspA and Borrelia render you unable to manage viral infections by the viral-managing TLRs. ”Won-der-ful” as the rich people in Fairfield Country, Corrupticut like to say. We’ve all seen them. They warn particularly against fungal infections, against taking immune suppressing drugs like steroids, and that there is a risk of Lymphoma. Well, what causes Lymphoma? "A lipidation/processing reaction has been described for the intact OspA gene of B. burgdorferi. The primary translation product of the full-length B. burgdorferi OspA gene contains a hydrophobic N-terminal sequence, of 16 amino acids, which is a substrate for the attachment of a diacyl glyceryl to the sulflhydryl side chain of the adjacent cysteine (Cys) residue (at position 17). Following this attachment, cleavage by signal peptidase II and the attachment of a third fatty acid to the N-terminus occurs. The completed lipid moiety, a tripalmitoyl-S-glycerylcysteine modification, is termed Pam3Cys (or is sometimes referred to herein as Pam(3)Cys or Pam3Cys). It has been suggested that the lipid modification allows membrane localization of proteins, with polypeptide portions exposed as immune targets. In addition to serving as targets for the immune response, Pam3Cys-modified proteins, such as OspA, have been reported to act as potent inflammatory stimulants though the toll-like 2 receptor mechanism (TLR2). Dattwyler says OspA is Pam3Cys and is a TLR2 agonist. So far, he is the only one who has openly admitted LYMErix never could have been an injectable vaccine. Or even admitted said what it was (Pam3Cys). HHS.gov claims to not know. Yale says they do not know what OspA is (it was their vaccine, LYMErix), the CDC said they do not know what OspA is, Paul Auwaerter said he does not know what OspA is, NIH Director Francis Collins did not know, NIAID director Anthony Fauci did not know, and IDSA refused to reply to our emails or phone calls. “Here, take this here vaccine. We don’t know what it, OspA, is. And just about no one has this disease it prevents. And when they do, like Wormser and Klemper said, the people only have arthritis and no other symptoms. Hulínská D1, Roubalová K, Schramlová J.
Epstein-Barr is known to have a human homolog of IL-10 and down-regulates the MHC or antigen-presenting cells and may be antibody-negative or seronegative in active disease. These could be 2 more reasons EBV contributes to so many cancers – in the Subimmune Class of diseases -, as well as its well-known association to Autoimmune diseases. Fungal infections contribute to all Great Imitator Autoimmune and Great Imitator No-immune diseases like cancer, also. KK. Coxsackie in Chronic Fatigue Muscles and Ticks, also very cute. Br Med Bull. 1991 Oct;47(4):852-71. Persistent virus infection of muscle in postviral fatigue syndrome. Cunningham L1, Bowles NE, Archard LC. Polio-like syndromefound in children who tested positive for enterovirus 68. Nonspecificfebrile illness is the most common presentation of enterovirus infection. Other than fever, symptoms include muscle pain, sore throat, gastrointestinal distress/abdominal discomfort, and headache. In newborns the picture may be that of sepsis however, and can be severe and life-threatening. Enteroviruses are by far the most common causes ofaseptic meningitis in children. In the United States, enteroviruses are responsible for 30,000 to 50,000 meningitis hospitalizations per year as a result of 30 million to 50 million infections. Bornholm diseaseor epidemic pleurodynia is characterized by severe paroxysmal pain in the chest and abdomen, along with fever, and sometimes nausea, headache, and emesis. Pericarditisand/or myocarditis are typically caused by enteroviruses; symptoms consist of fever with dyspnea and chest pain. Arrhythmias, heart failure, and myocardial infarction have also been reported. Acute hemorrhagic conjunctivitiscan be caused by enteroviruses. Herpanginais caused by Coxsackie A virus, and causes a vesicular rash in the oral cavity and on the pharynx, along with high fever, sore throat, malaise, and often dysphagia, loss of appetite, back pain, and headache. It is also self-limiting, with symptoms typically ending in 3–4 days. Hand, foot and mouth diseaseis a childhood illness most commonly caused by infection by Coxsackie A virus or EV71. Encephalitisis rare manifestation of enterovirus infection; when it occurs, the most frequent enterovirus found to be causing it is echovirus 9. A 2007 study suggested that acute respiratory or gastrointestinal infections associated with enterovirus may be a factor inchronic fatigue syndrome. Diabetes mellitus type 1It has been proposed that type 1 diabetes is a virus-triggered autoimmune response in which the immune system attacks virus-infected cells along with the insulin-producing beta cells in the pancreas. A team working at University of Tampere, Finland has identified a type of enterovirus that has a possible link to type 1 diabetes (which is an autoimmune disease). Are people getting foot and mouth disease from Plum Island-escaped ticks, too (Plum Island has always experimented with Hoof and Mouth disease)? Imagine how sick people are with Lyme, if they have all these combined devastating illnesses? Yet, we’re all trashed aren’t we? Are we trashed because this is crime or are we trashed because we represent a bioweapons experiment (escaped ticks) gone horribly wrong? Why is the CDC lying about all this? For CDC personnel/staff vaccines incomes reasons? Has this scam gone on so long the CDC and NIH finds no way of backing away from all their lies? Is the HHS.gov mortified at the prospect at having been discovered to 200% incompetent to their mission? J Clin Microbiol. 2005 Jul;43(7):3471-3. Possible tick-borne human enterovirus resulting in aseptic meningitis. Freundt EC1, Beatty DC, Stegall-Faulk T, Wright SM. But everyone who says tick bites cause chronic disease is called crazy, including Edwin Masters. But get the cabal’s vaccines. One minute it’s our fault for getting rid of LYMErix, and the next minute no one has any kind of real disease anyway. This is them. The experts. At making everyone’s head spin. J Exp Med. 2013 Jan 14;210(1):59-70. doi: 10.1084/jem.20121801. Epub 2013 Jan 7. A mutated B cell chronic lymphocytic leukemia subset that recognizes and responds to fungi. Hoogeboom R1, van Kessel KP, Hochstenbach F, Wormhoudt TA, Reinten RJ, Wagner K, Kater AP, Guikema JE, Bende RJ, van Noesel CJ. B cell chronic lymphocytic leukemia (CLL), the most common leukemia in adults, is a clonal expansion of CD5(+)CD19(+) B lymphocytes. Two types of CLLs are being distinguished as carrying either unmutated or somatically mutated immunoglobulins (Igs), which are associated with unfavorable and favorable prognoses, respectively. More than 30% of CLLs can be grouped based on their expression of stereotypic B cell receptors (BCRs), strongly suggesting that distinctive antigens are involved in the development of CLL. Unmutated CLLs, carrying Ig heavy chain variable (IGHV) genes in germline configuration, express low-affinity, poly-, and self-reactive BCRs. However, the antigenic specificity of CLLs with mutated IGHV-genes (M-CLL) remained elusive. In this study, we describe a new subset of M-CLL, expressing stereotypic BCRs highly specific for β-(1,6)-glucan, a major antigenic determinant of yeasts and filamentous fungi. β-(1,6)-glucan binding depended on both the stereotypic Ig heavy and light chains, as well as on a distinct amino acid in the IGHV-CDR3. Reversion of IGHV mutations to germline configuration reduced the affinity for β-(1,6)-glucan, indicating that these BCRs are indeed affinity-selected for their cognate antigen. Moreover, CLL cells expressing these stereotypic receptors proliferate in response to β-(1,6)-glucan. This study establishes a class of common pathogens as functional ligands for a subset of somatically mutated human B cell lymphomas. Cute. You can see how dangerous it is to have stupid criminals at the CDC, Yale, NYMC, NIH and elsewhere be in charge of something called a “GREAT” “Imitator” and for medical schools not to require a science pre-med Bachelors degree. Chronic Lyme can't be about spirochetes and biofilms and co-infections (Oh, My!) if LYMErix vaccination caused the exact same systemic and neurologic disease as Lyme. The following are scientists who know what they are talking about regarding Lyme/spirochetes and OspA as immunosuppressive. Notice that none of the Lyme "non-profits" tell you what Lyme and Lyme cryme are all about. They do not want anything to change. They are happy about all the people who die from Lyme disease as long as their "CEOs" make several hundred thousand dollars a year for doing nothing but being blowhard self-promoters.